After releasing to Windows Insiders on the Fast ring early November 2015, and Slow ring few days later for week-long beta testing, Windows 10 Build 10586 has been released to general public as the first major update for Windows 10 operating system on November 12, 2015. Windows 10 was launched in July 2015, also to Windows Insiders prior to public release. 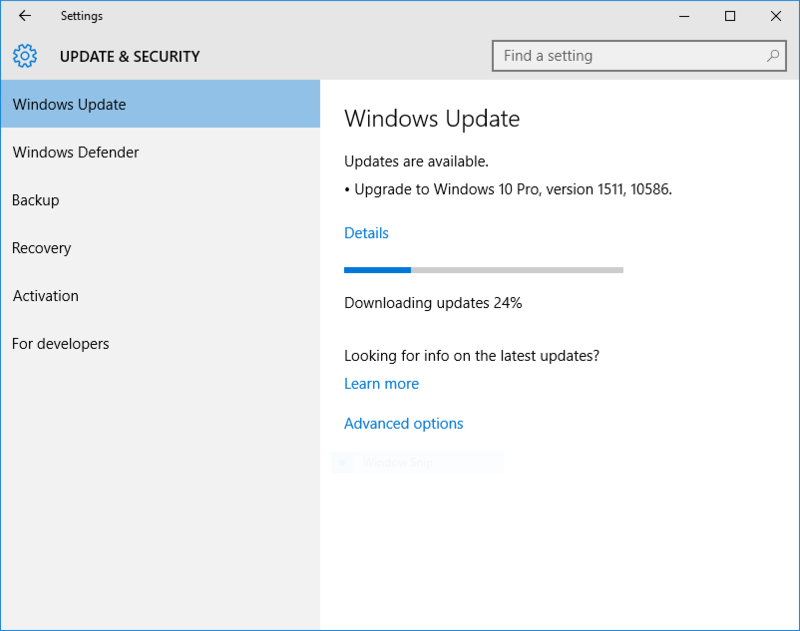 Microsoft calls the release as Windows 10 November Update, though it’s also referred to as Windows 10 Threshold 2 (TH2) from its development branch (Windows 10 RTM is of Threshold 1 – TH1 branch), Windows 10 November Refresh, Windows 10 Fall Update, Windows 10 Fall Refresh, Windows 10 Wave 2, Windows 10.1, Windows 10 Service Pack 1 (SP1), Windows 10 Build 10586 and etc. In Windows Update, the update is identified as Windows 10 version 1511, 10586. The full build string of Windows 10 Build 10586 is 10586.th2_release_sec.151104-1948 and 10586.3.amd64fre.th2_release_sec.151104-1948. Windows 10 version 1511 (Build 10586) packs a lot of new features and functionality which makes it a better OS. Check out what’s new in Windows 10 version 1511. If you’re Windows Insider already upgraded to Windows 10 Insider Preview build 10586, you are already using the latest version of Windows 10. For other Windows 10 users running Windows 10 RTM Build 10240, or Windows 7 and Windows 8.1 users who haven’t upgraded, check for new updates in Windows Update, and it will automatically detect, download and install the latest update. In addition, you can also download Windows 10 version 1511 (10586) November Update ISO images to immediately and directly upgrade to Windows 10 Build 10586 using the Windows 10 Media Creation Tool which has been updated by Microsoft to incorporate the November Update. From Windows 10 version 1511 (10586), users can clean install and activate Windows 10 using their Windows 7, Windows 8, Windows 8.1 and Windows 10 product keys, without the need to perform an upgrade cycle before clean install is allowed. Remember to clean up and reclaim hard disk space after upgrading after you’re sure that the system is error free and you no longer want to downgrade, which potentially frees up tens of gigabytes of storage space.